OTTAWA - The Tory-dominated, closed-door Senate committee studying Mike Duffy's improper housing expenses deleted a specific reference to his failure to co-operate with auditors before releasing its report to the public. Duffy, meanwhile, said Wednesday he's pleased that same committee will be reviewing his expenses once again. A draft of the internal economy committee's report from earlier this month, obtained by The Canadian Press, shows the sections of the report that were later dropped. Duffy's apparent stonewalling of auditors happened after he had repaid $90,172 in expenses, a payment facilitated by a secret exchange of money with Prime Minister Stephen Harper's then-chief of staff Nigel Wright. Wright has since resigned and Duffy has left the Tory caucus. The dropped paragraph details how the firm Deloitte was rebuffed when it asked Duffy again to provide additional documents, and for a meeting with his lawyer. "In the circumstances the review that Deloitte has been asked to undertake is now unnecessary," Duffy's lawyer is quoted as saying in the original committee report. "The considerable time required for Sen. Duffy to compile the extensive information and documentation required of him by Deloitte as well as his participation in the review of that material, to say nothing of the public expense involved in the same, is no longer needed." Another section of the report, describing the language that defines a primary or secondary residence as "unambiguous," was also deleted — but it remained in the reports tabled on two other senators, Mac Harb and Patrick Brazeau. The Liberals on the committee opposed the final Duffy report when it was tabled in the Senate on May 9. "My understanding is that the committee reported, used different wording for Sen. Duffy because the money had been repaid, and in the case of Sen. Harb and Sen. Brazeau, that language was used as an instrument to collect the money," said Conservative Sen. Marjory LeBreton. LeBreton was asked whether there was a secret agreement to go easy on Duffy in the report. "That is an allegation that I have absolutely no proof of," she replied. The Conservatives have now tasked the same committee with reviewing Duffy's expenses again. 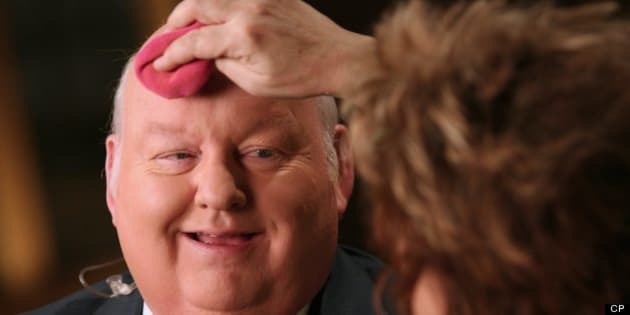 The Canadian Press reported last week that Duffy had been campaigning for the party across the country on some of the same days he said he was on Senate business. Liberal senators had wanted to send Duffy's expense file straight to the RCMP, but their motion to do so was deemed out of order by the Senate Speaker late Tuesday night. "I think that this whole controversy has reached the stage where we need to have a new set of eyes look at it, that it's appropriate to put this in the hands of people who are trained to do these kinds of investigations," said Liberal Senate leader James Cowan. Cowan added Wednesday night that he had sent a letter to the chair and vice-chair of the senate committee, urging them to make future meetings on Duffy's expenses open to the public and the media. "In order to regain the public's trust, Canadians need to be reassured that this crisis will be dealt with fairly, impartially and comprehensively, and that can only be achieved by ensuring that all future meetings on this matter are held in public," he wrote in the letter. Cowan said he hoped LeBreton would sign the letter as well but, he said, she declined. Auditors at Deloitte said in their own report that because of Duffy's failure to give them all the requisite documents, they couldn't determine which days he was claiming expenses. Duffy released a statement saying he welcomed the fact the internal economy committee would be taking up the matter again. "Canadians deserve to know all the facts. I am confident that when they do they will conclude, as Deloitte has already concluded, that my actions regarding expenses do not merit criticism." Duffy was in the Senate chamber Wednesday, but did not speak to reporters as he left the building. A woman driving the minivan that picked him up honked at camera technicians who waited outside on Parliament Hill. Prime Minister Stephen Harper, fielding his first public questions on the matter since it erupted last week, said he assumed what many Canadians did when he first learned of Duffy's repayment: that he footed the bill himself. "Look, I think my belief here was reasonable ... that when it was said that Mr. Duffy had repaid his expenses, that indeed he — and not someone else — had repaid his expenses," Harper said. "I know Mr. Wright assisted him or did this for him, because he wanted to see the taxpayers reimbursed. That's the right motive, but nevertheless it was obviously not correct for that decision to be made and executed without my knowledge or without public transparency." Harper spoke in Peru, where he is on a trade mission in South and Latin America, leaving Foreign Affairs Minister John Baird to respond to questions in the House of Commons. Baird said Tuesday that two "independent" investigations were being undertaken into Duffy's expenses, without naming the investigators. It subsequently emerged that the parliamentary ethics commissioner and the Senate internal economy committee were involved. NDP Leader Tom Mulcair said no Canadian would consider the Senate committee an "independent" review. "Does the minister not realize that that's about as credible as Paul Martin asking Jean Chretien to investigate the sponsorship scandal?" Mulcair snapped in the Commons on Wednesday. Liberal Leader Justin Trudeau flatly accused the government of obstructing a Senate audit. "We know now that Conservatives on the Senate committee on internal economy used their majority to doctor the final report on Sen. Duffy's expenses," Trudeau charged. "Can anybody on that side of the House tell us who gave the order to whitewash the report on Sen. Duffy?" Baird said the committee report was clear "that these expenses should not have been expensed." "No one in the government is disputing that fact. As I understand it, the report did in the end reflect the fact that repayment had been made."